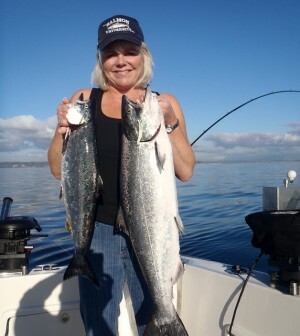 One of the best things about living in western Washington is that a saltwater angler can find a place to fish for salmon all year long. Sure, some months the options are pretty limited and the fishing might best be described as marginal, but at least there’s an open season and an opportunity to hook up. 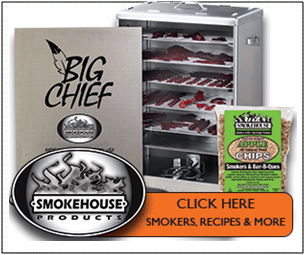 And, during the winter months, when the uninformed might think the pickings would be at their slimmest, there are plenty of places where someone in need of a salmon fix can get out of the house and get their salmon fix. Wintertime is blackmouth time in these parts, and for the next two or three months there are lots of places where saltwater fishermen can chase these resident kings of winter. 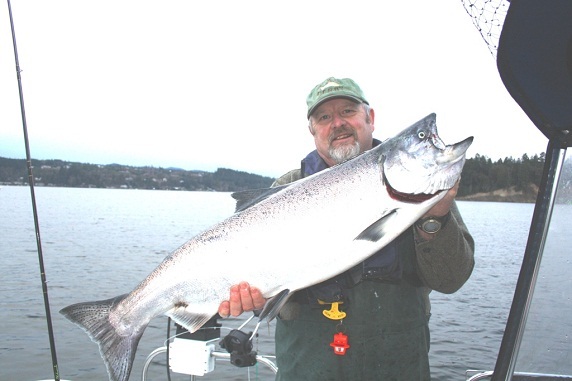 Immature Chinook ranging from just-legal 22-inchers to bragging-size 22-pounders are not only abundant in some places, but they’re almost always hungry wherever they’re found. I’ve been talking to some of the area’s best blackmouth anglers, and here’s what they have to say about catching these little kings with the big appetites. Whatever area Nelson is fishing, when he’s after blackmouth he’s fishing near bottom, within 10 to 20 feet, because that’s where the bait is usually found. Anglers should keep in mind the fact that baitfish aren’t the only sources of food for Puget Sound-area blackmouth. There are usually lots of squid around, especially late in the winter and in early spring, and when he wants to replicate fresh calamari, Nelson turns to plugs. He fishes them without flashers or anything else, and usually runs them farther back behind the downrigger than he runs flasher gear, about 40 feet. He also fishes them about 10 feet higher in the water column than the flashers. With that kind of spacing, a fish that turns up after missing the spoon, fly or squid he’s fishing behind the flasher will have that plug coming along right at eye level. As for trolling direction, Nelson notes that blackmouth are active feeders, willing to chase bait, so he fishes with the current to cover lots of water and troll his gear right into their faces. He doesn’t, however, troll in a straight line. 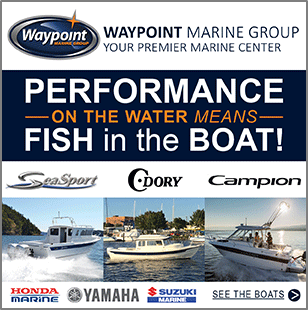 A slight zig-zag pattern gives the rigs a chance to slow down on one side of the boat and speed up on the other. “If I had to pick one speed to troll, it would be 2.5 miles an hour, but sometimes a slower or faster presentation pays off,” he says. 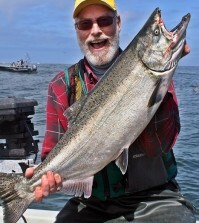 As for where Nelson likes to apply his favorite blackmouth tricks and techniques, his favorite haunts are the places noted for their bigger winter fish, like the San Juans, waters off Point No Point and, in the late-winter and early spring, northern Hood Canal and Mid-Channel Bank. Like Tom Nelson and lots of other successful wintertime salmon anglers, Captain Gary Krein at All Star Fishing Charters in Everett also likes spoons for blackmouth, and his go-to spoon these days is a 3 ½-inch or 4-inch Silver Horde/Gold Star King Fisher Lite in either the Irish Cream or Cookies N’ Cream finish. He fishes the spoon on a 25-pound leader, 38 to 40 inches behind an 11-inch flasher, usually a Hot Spot. Favorite flasher colors are some shade of green or white. Sometimes he smears a little Smelly Jelly on his spoons, but not always. Something else Krein does some of the time is replace the standard King Fisher spoon with the “Tail Wagger” Hoochie Hook version, the one with the #15 Octopus Squid Skirt on the hook, especially in situations where he wants to slow the spoon’s action at a faster trolling speed. Fish like this 17-pounder from Hood Canal aren’t the norm, but they’re a distinct possibility for Northwest Blackmouth anglers. Krein spends much of this blackmouth season on Possession Bar, working his gear within 20 feet of the bottom in 120 to 150 feet of water. Although he likes to maintain a GPS speed of about 2 miles per hour, he’s quick to point out that a 20- to 30-degree angle on his downrigger wire is more important. “Maintaining the proper lure action depends more on speed through the water than speed cross the bottom,” he says. 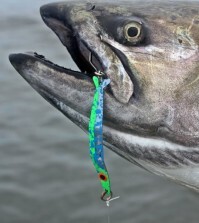 Good friend and salmon fanatic Jay Field of Dash One Charters in Anacortes can be found somewhere in the San Juans throughout the long Area 7 blackmouth season, and the rig he’s most likely to be pulling behind his downriggers at the start of the day is a Needlefish Hoochie or Needlefish Ace-Hi Fly in a green spatter back finish. 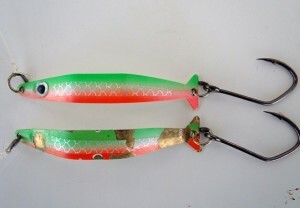 He rigs both with tandem-tied 4/0 Owner SSW Cutting Point hooks and fishes them 32 inches behind an 11-inch flasher. Field notes that there’s a lot of small bait, especially candlefish, in the islands, so Silver Horde/Goldstar’s Coho Killer is another of his favorites. Water Melon, Chrome and White Lightning are his three favorite finishes, and he likes to fish them 26 inches behind an 8-inch flasher. He also fishes the three-inch King Fisher Lite in Green Glo and Irish Cream, which he also fishes 26 inches behind an 8-inch flasher. Although spoons and hoochies work well for Field, he isn’t a hardware purist, and he usually hedges his wintertime bets by carrying bait. Field likes his herring green-label size, and rigs it for downrigger trolling with tandem-tied 3/0 or 3/0-4/0 Owner Cutting Point hooks tied on 20-pound monofilament leader material. His 7- to 9-foot leader has a Sampo or Penn ball-bearing swivel in the middle and a No. 5 barrel swivel at the top end for quick connection to the ball-bearing swivel and Duo-Lock snap at the end of his main line. 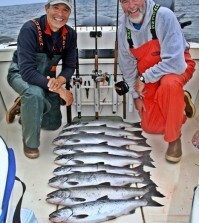 Tony Floor, longtime Washington Department of Fish and Wildlife spokesman and currently director of fishing affairs for the Northwest Marine Trade Association, calls himself a “herring guy” from way back when it comes to salmon fishing, and his philosophy doesn’t waiver when he’s fishing for blackmouth. 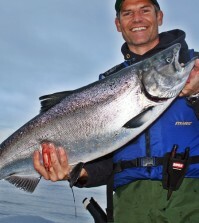 His standard rig for winter Chinook fishing is a green-label herring, plug-cut and fished on a pair of Mustad UltraPoint hooks so that it spins in a tight circle even at slow speed. He favors a 3/0 hook in front and a 2/0 in back. A six-foot leader of Berkley Big Game UltraClear or 15-pound fluorocarbon runs to a swivel that connects leader to main line. Floor likes six-bead swivel chains because he feels that even if two or three of the beads become tangled with weeds or grass, the others will continue to work and reduce or eliminate line twist. (bottom lure) is still catching fish. After snapping his line into the downrigger release about 25 feet behind the ball, Floor fishes with the current, five to 10 feet off the bottom whenever and wherever possible. His favorite wintertime blackmouth haunts are in and around the San Juan Islands, where he can find places to fish on both the flood and ebb tides. Ideal conditions, he says, are moderate tides when the exchange is about a foot per hour. As for me, I do most of my blackmouth fishing in South Puget Sound and Hood Canal, and my go-to blackmouth rig in both areas the past several winters has been a 3 ½-inch or 4-inch Coyote Spoon (older models that I horded in years past) in a chartreuse/fish-scale finish (color #0580) behind an 11-inch Pro-Troll HotChip Flasher in a color combination the folks at Pro-Troll call Green Stryper. About 42 inches of 30-pound Berkley Big Game UltraClear monofilament separates the flasher from the spoon. I smear a little Smelly Jelly (usually herring or anchovy scent, although I doubt that it makes a whole lot of difference what flavor you use) on the concave (chrome) side of the spoon, and a little more near the tail end of the flasher. I mentioned the fact that I like the “older” Coyotes, of which I still have dozens stashed away in my boat and in my shop, because, quite frankly, the newer ones (which aren’t made in Hood River anymore) don’t work very well for me. Knowing that my old Coyotes will some day be gone, I’ve been experimenting with Silver Horde/Gold Star’s Sonic Edge spoons, which feature a small blade on the hook ring, similar to the Coyote, and I like what I’m seeing. It may not be long before they make their way to the top of my blackmouth-getter list. In the past I’ve had some problems with line-twist while using my spoon-and-flasher rigs, so I now tie a size 3 Sampo or Berkley ball-bearing swivel in-line, about a foot above the flasher. I don’t like running the risk of hindering the action of an attractor or lure by adding too much weight directly to it, and that’s why the swivel goes up the line a ways rather than using a snap-swivel attached directly to the top of the flasher. 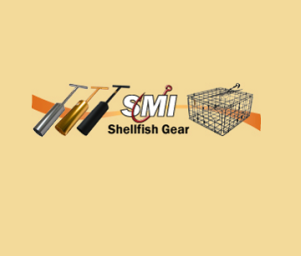 But don’t tie the swivel too far above the flasher; making the entire rig too long which could cause problems when you’re trying to get a hooked salmon close enough for netting. As in most of the trolling I do for Chinook any time of year, I like to troll for blackmouth with or across the current rather than into it, but even if I’m trolling against the flow I usually gauge my speed by the angle of my downrigger cable, not by the numbers my electronics are giving me. The flasher and spoon typically work best for me when that entry angle is about 25 degrees, and I typically achieve that line angle at a boat speed of 1.7 to 2.2 miles per hour. That speed, though, may vary greatly if I’m going with or against the current. Most of the fishing I do is in 70 to 120 feet of water, and most of the time I try to keep the downrigger ball within 10 feet of the bottom. Of course, if I start marking fish or bait consistently at some depth higher in the water column, I may hit the “up” button on at least one downrigger and get a lure up to where the action might be. 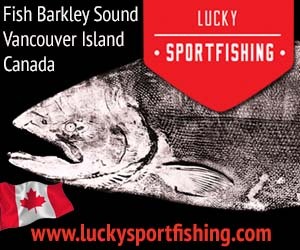 There’s a pretty good chance that those mid-level marks are shakers, though, and sub-legal Chinook have no qualms about smacking a 3 ½- or 4-inch spoon, so if I start hooking a lot of little salmon at those middle depths I send the gear back down and continue looking for larger prey.